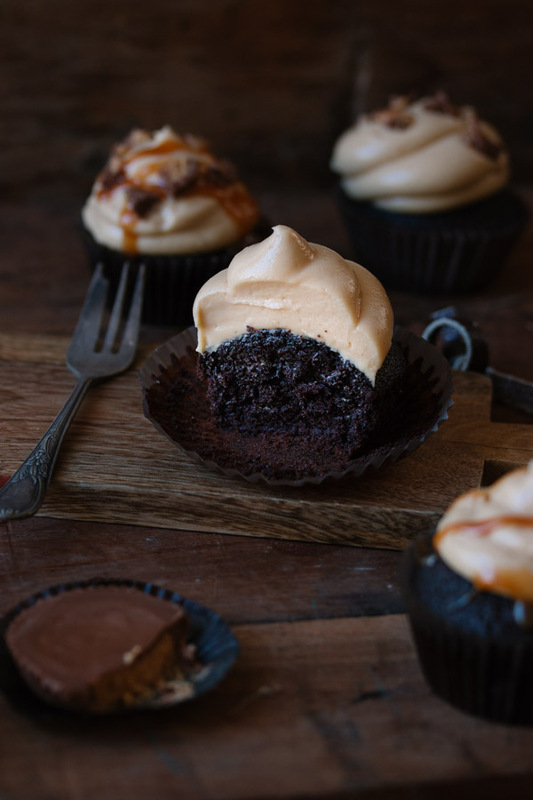 Chocolate Peanut Butter Cupcakes | Pretty. Simple. Sweet. Fudgy and moist chocolate cupcakes topped with a satiny, luxurious cream cheese peanut butter frosting. I’m warning you, guys, these cupcakes are too good to be true. According to Erez, these are the “best cupcakes [I’ve] ever made.” Then, just 2 minutes later while he was grabbing a second one (so not like him! ), he told me they were the “best cupcakes [he’d] ever tasted”. As much as Erez is the type to give compliments, if he doesn’t like something, he’ll be honest about it (even when he shouldn’t…), so you can take his word on this. In almost every cupcake recipe I’ve posted so far, I’ve mentioned my mixed emotional history with cupcakes. I used to not like them much, thinking they were only pretty treats without much flavor or substance. One time, when a customer requested some for an event, I sighed. All my attempts of convincing him to back off from the idea failed, and he left me with no other choice than going into the kitchen and baking cupcakes like crazy. It became my top mission. My first few attempts ended in failure. Pounds and pounds of butter and sugar were ultimately thrown out. The kitties were happy, but I wasn’t. Although I eventually served cupcakes that I was proud of, they were still far from perfect (and I hope my customers don’t read my blog). A couple of months later, I found myself in New York City. For some, the city of dreams; for me, the city of cupcakes. Seeing such a huge variety of tastes, textures, and colors opened the door to a whole new world – one that I had seen from afar, but finally understood. Let me make this long story short. I came back home, motivated to try baking cupcakes again after requesting (i.e., demanding) some tips from a few of the bakeries I visited, and baked until I was finally able to get the result I was looking for – not too sweet of a frosting, not too dry of a cake, and flavorful as can be. Mission (finally) accomplished. The first cupcake I tried that I really loved was this one, a combination of chocolate and peanut butter. I love adding cream cheese to frostings because it gives a slight tang that perfectly contrasts the sweetness of the sugar. In this specific frosting, there isn’t much sugar anyway since the peanut butter makes it thick enough. However, once in a while you will find me sneaking in some extra peanut butter. This is my favorite chocolate cupcake batter, and I like to play with the recipe sometimes by replacing the milk with buttermilk or additional hot water, or using oil instead of butter for extra fluffiness and moisture. For a more cake-like cupcake, though, I like to use the creaming (butter) method. Fill cupcakes with chocolate ganache (to make a ganache, melt 6 oz. chocolate and ½ cup heavy cream in the microwave). Drizzle cupcakes with caramel sauce. Top cupcakes with pieces of peanut butter cups. Mix 1 teaspoon of instant coffee granules in the hot water to enhance the chocolate flavor. Place one mini peanut butter cup in the middle of each cupcake: Fill cupcake cups halfway with batter, place peanut butter cup in the center, and pour the rest of the batter on top. Use an ice cream scoop to fill the cups more easily. Fill any empty cups in the tin halfway with water for even baking. Preheat oven to 350F/180C. Line muffin tin with cupcake liners. Set aside. In a standing mixer fitted with the paddle attachment, beat together butter and sugar on medium speed until light and fluffy, about 2-3 minutes. Scrape down the sides and bottom of the bowl as necessary. On medium speed, beat in eggs, one at a time, beating well after each addition. Add vanilla extract and beat until combined. With the mixer on low speed, add half of the dry ingredients and beat just until combined. Beat in the milk until combined. Add the other half of the dry ingredients and beat slowly until combined. Add hot water and beat just until combined. Do not over mix – the less you mix, the lighter the cake will be. The batter should be liquid-y. Divide batter evenly between cups, filling them about ¾ full. 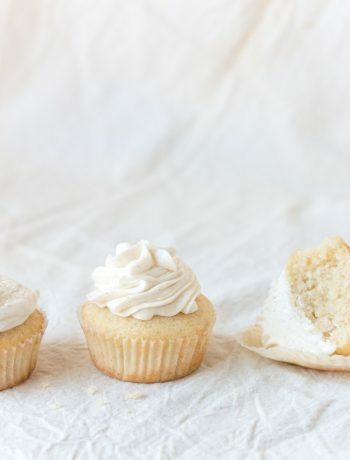 Bake for 15-20 minutes (or 8-10 minutes if making mini cupcakes), until a toothpick inserted into the center comes out clean or with just a few moist crumbs. Allow cupcakes to sit for 10 minutes, then remove from pan and allow to cool completely on a wire rack. For the frosting: In the bowl of an electric mixer fitted with the paddle attachment, beat together butter, peanut butter, and cream cheese on medium speed until smooth and creamy, 2-3 minutes. Add powdered sugar and beat until smooth. Beat in vanilla and salt until smooth and fluffy. Add more sugar as necessary until desired consistency (thick enough to pipe). Frost cupcakes once they’ve cooled. Because of the cream cheese frosting, cupcakes should be stored (covered, in an airtight container) in the fridge. They’ll keep for 3 days. Bring to room temperature before serving. Unfrosted cupcakes can be kept tightly covered at room temperature for up to 3 days or in the freezer for up to 2 months. Thaw, still covered, on the counter or overnight in the fridge. These cupcakes sure look SUPER DELICIOUS !! Thank you Winnie! This is my favorite combination, too! These look fabulous! 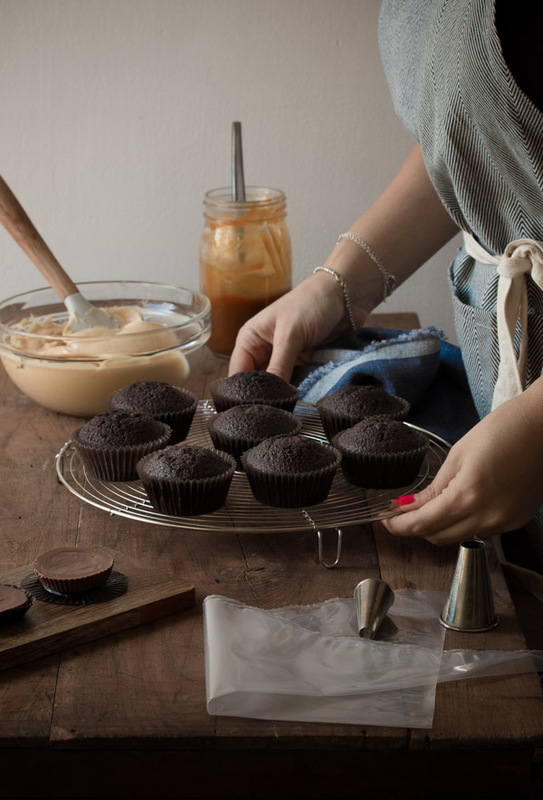 I love peanut butter – on top of a chocolate cupcake? Yes, this is my kind of dessert. Pinned! This is my kind of dessert, too 😉 Thank you Kristi! 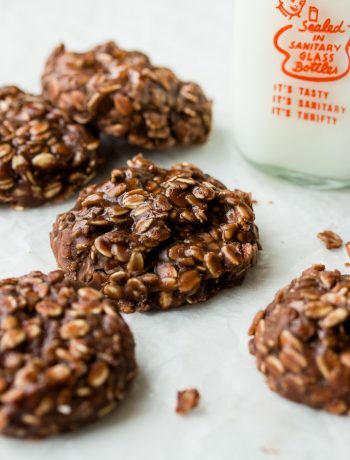 Have you made these with unsweetened dutch cocoa powder? Could it be made using the dutch version? I am unable to find natural cocoa powder in any store. Thanks for the help! Hi Megan! This substitution would affect both the flavor and texture, still, Dutch-processed cocoa powder will work here (use the same amount), just make sure to substitute the baking soda in the recipe (that was needed for the acidity of the natural cocoa powder) for 2 teaspoons baking powder. I cant believe I’m trying out more and more of your recipes despite the fact that I’m trying my best to stay away from all these yummy deserts and cakes! !Hats off to you for pulling out these recipes ! I have a gathering coming up this weekend and so decided to whip up your gorgeous chocolate cupcakes- I always do a test trial if I’m going to do it large scale. So I baked a batch and they turned out awesome. Now the truth is I’m too lazy to work with the frosting part even though that sounded delicious. I decided not to frost the cupcakes,but at the same time realised that the cupcakes could be a tad sweeter. How much sugar do you suggest I add to the amount mentioned?I added coffee too,to enhance the flavour.Do help me out here!! Thank you so much Shiran for your help . The cupcakes turned out gorgeous and had just the right amount of sweetness . Thanks a lot again . Next time , I will give the frosting a try !! I did end up making these with the dutch cocoa powder and your suggestion, and they turned out great! Nice and moist, great flavours with the icing. I think next time I will add the instant coffee to the cupcake batter to enhance the flavour. Thanks for your tips and a great recipe! Would these work as a cake as well? My daughter loves the look of these, but wants a traditional cake for her birthday! Thank you Kristy 🙂 If you want to make a chocolate cake, I highly recommend using the cake batter from this recipe. If you don’t want a 2-layer cake, you can just bake it in a single pan (baking time will be longer – about an hour). 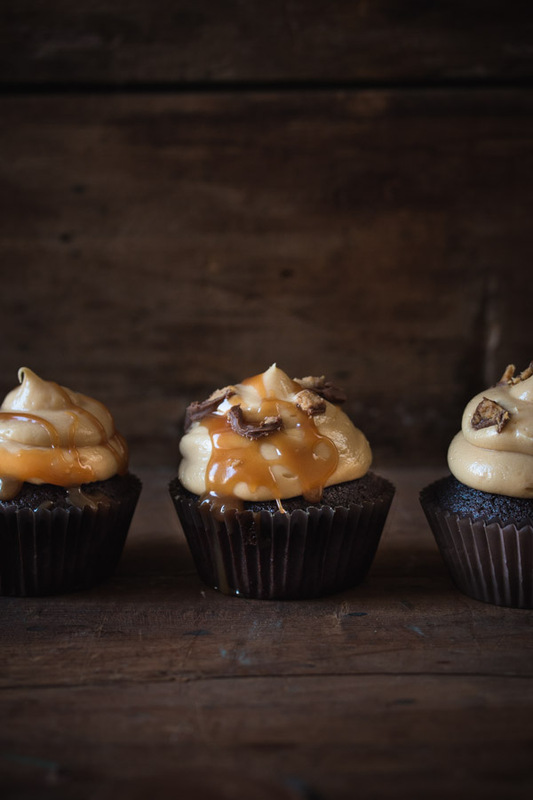 Then, make the peanut butter frosting from these cupcakes and frost the cake. It should be enough for a 1-layer cake, but if you want more layers, maybe you should make more of the frosting. Happy Birthday! Thank you so much! She is going to be thrilled! 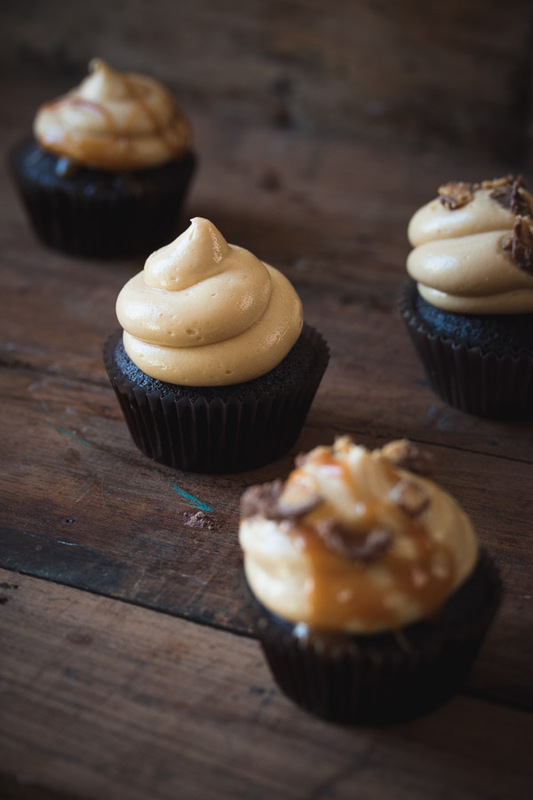 Good grief – I just made your cupcakes and can’t believe how great they are – especially the peanut butter frosting. This is definitely going to be a favourite from now on. I am making caramel sauce to drizzle overtop as well. Fantastic recipe – thanks so much! Thank you so much Angela! These are my husband’s favorite cupcakes 🙂 Caramel or salted caramel will be amazing with these! What if I don’t use whole milk? Will that effect the baking? Hi Pam, you can substitute it with water, and use 1 cup of hot water in total. The cupcakes taste delicious this way too! Hi Mara, the amount of espresso is really up to you, you can add as much as you like, but make sure to reduce the amount of water accordingly. So if you use 1/4 cup espresso, reduce the amount of water by 1/4 cup. Adding melted to the batter will affect the texture. Try adding a little bit to see if you like the result, about 20-30g. Hello Shiran, from your comments the recipe sounds amazing. I am big on moist cupcakes and fluffiness. 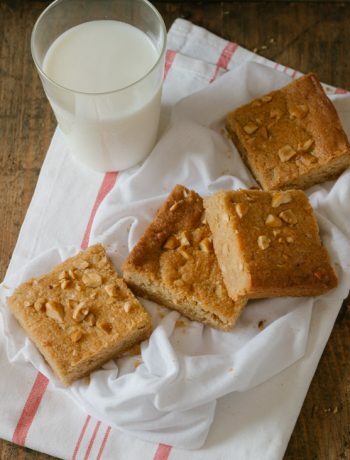 How would I convert the milk for buttermilk, additional hot water, and using oil instead of butter because I know the recipe calls for the creaming method . I will be making these cupcakes for Sunday Thankyou. Hi Imani, if you’re using oil, you don’t need to use the creaming method, instead, mix all the wet ingredients together, then the dry ingredients and combine the two mixtures together. You can try to replace the milk with buttermilk. Keep in mind that each change would yield a different result. While oil adds fluffiness for example, the creaming method produces more cake-like texture. I made these for a work event and ended up only bringing 6 because my husband and I ate half the dozen before… So yes these are AMAZING! I want to make these as a cake for Thanksgiving, how much longer would you recommend to leave it in the oven in a spring form? Thanks already! It happens to me all the time! 🙂 I’m so glad to hear you like it so much! Here’s my recipe for my favorite chocolate cake that I highly recommend. You can bake it in two 9-inch round pans or one 13×9-inch pan. Then you can frost it with the peanut butter frosting. Since I haven’t used this cupcake recipe to make a cake, I don’t know the exact pan size or baking times. I can honestly say that these are the tastiest cupcakes that I have ever made/eaten. Your recipes are so good. This was the second one I have tried. I can’t wait to make more! First cupcakes I ever made. I used espresso instead of hot water but otherwise sticked to the recipe. This was easy to follow and what an amazing result thank you! My very first two attempts at cupcakes. Both attempts using your recipes. Folks have given sensational reviews. They are really delicious and look wonderful. The cakes are moist and light. The icing is like a flavorful cloud. More flavor and less sweet is the way to go. I am intrigued to try more of your recipes and will be doing just that very soon. Hi! If I wanted to make these mini how long would I bake them for? Bake them for about 9-12 minutes.